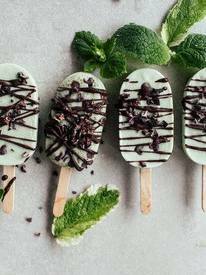 Freshmint & choc chip popsicles! These are extra refreshing because of the fresh mint in there and because they’re popsicles, they’re a lot easier to make! I added matcha too, just for that pale green color, but leaving it out is just as good too.